Post subject: Which ward do you live in? Given the fact that this coming election will have some major changes made to it, from the election date to the number of wards and council representation, it would be interesting to know where the HV posters live. 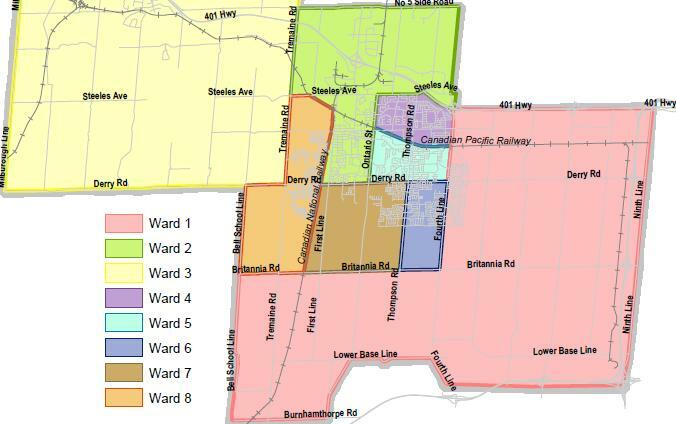 There will be two regional councillors elected with one regional councillor representing wards 2, 3, 4, 5 (commonly referred to the northern wards - north of Derry Road) and the other from wards 1, 6, 7, and 8. There are also going to be school trustees elected for both public school and seperate school boards (depending on who you pay your taxes to) I think there will be two public school trustees elected. And of course, there will be someone elected Mayor of Milton. You can view the ward map at http://www.milton.ca/townhall/projects/ ... ew.htm#new and find out where you are. I'm curious about what the breakdown of this poll will be. I'd like to sticky-this. If you already live in Milton, or will be living in Milton this year still, please complete this poll !! I'm copying-pasting a snippet of the map to make it easier for people to quickly find their ward. Ward 3 extends a bit further north than the copy/paste below. I couldnt vote. It said minimum 15 posts to be eligible to vote. One more post and youre there. Ward 4 here. Proud to be voting for Colin! (EDIT) and with this post, I was able to vote as well! Ward 8 here, who's running in our area? Who is running from Ward 7? You are ward 7. So far just Marshall Homer is registered for running in ward 7, but others are still planning to register in the coming months. Wow. Having trolled/posted on this board for nearing 2 years, I'd have thought there'd be more 6 and 7. Seems like HVE was in the minority. Maybe things have changed and I just haven't noticed. EDIT: Also, I'm not sure about other people. But on forums, I tend to skip most of the 'Sticky' threads. Not sure why, but it was by fluke that I mis-clicked on this thread and realized it wasn't an old out of date Sticky. Last edited by big_mac on Wed Sep 29, 2010 1:04 pm, edited 1 time in total. Another 2 votes here for Zeeshan! Custom vinyls to define your space.